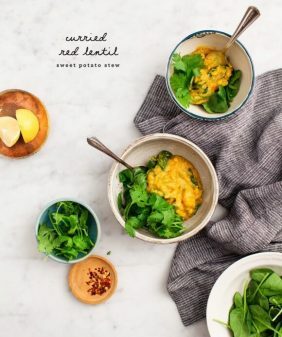 Pumpkin Coconut Curry is the perfect healthy comfort food for fall! 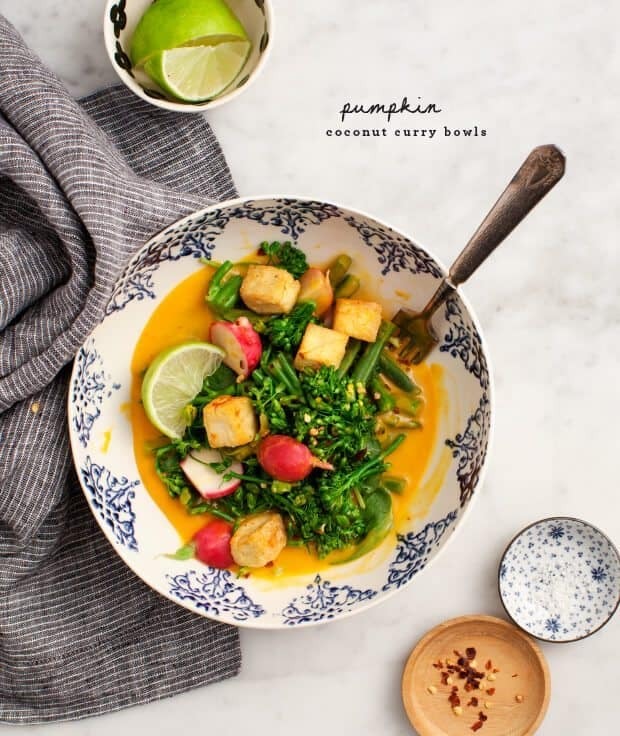 Creamy vegan pumpkin curry sauce coats tofu and steamed vegetables. Spicy & simple. I’ll admit that when it comes to pumpkin I often reach for a can, but the flavor and texture that come from a fresh pumpkin are really worth it. I made pumpkin hummus, pumpkin salad, pumpkin soup… and of course the pumpkin coconut red curry sauce that is pictured here. This sauce is rich and creamy, so to keep things light, I topped these bowls with vibrant steamed vegetables and baked tofu. Feel free to change up the vegetables however you like – cauliflower, red peppers, kale, even cubed roasted pumpkin would be delicious here. Just alter the cooking time accordingly. These bowls are warm, creamy, rich, coconut-y, and a little spicy… my only regret is that the leftovers are all gone. 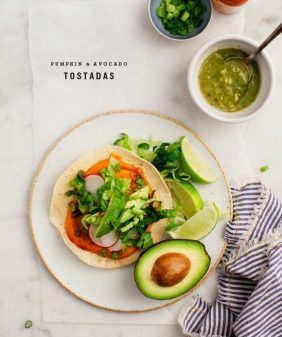 Make the pumpkin curry sauce: In a blender, puree the pumpkin mash, coconut milk, curry paste, garlic, lime juice, and a few generous pinches of salt and pepper until smooth. Set aside. Preheat the oven to 350°F and line a baking sheet with parchment paper. Toss the tofu with a drizzle of olive oil and a pinch of salt and pepper. Bake until golden brown around the edges, 15 to 20 minutes. Remove from the oven and toss it with the sriracha. 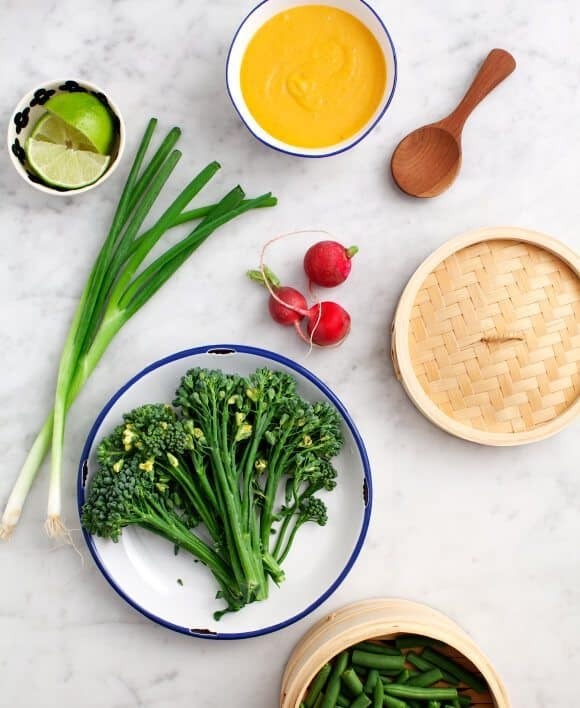 Meanwhile, place the broccolini, green beans, scallions, and radishes into a steamer basket with a pinch of salt and a light drizzle of olive oil. (I like to use a bamboo steamer). Steam until tender, but still vibrant (broccoli, about 10 minutes, green beans, scallions and radishes, about 15) You could also saute these vegetables in a skillet. If necessary, reheat the pumpkin curry sauce. If it's too thick, add a few tablespoons of water to thin. 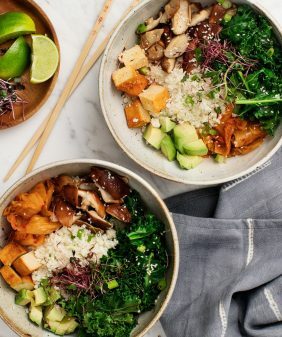 Assemble bowls with about ½ cup of the sauce, the steamed vegetables, tofu, and a pinch of red pepper flakes. Serve with lime wedges. *Roast the pumpkin: Preheat the oven to 400°F and line a baking sheet with parchment paper. Slice a small 2 to 3 lb. sugar pie pumpkin in half, and scoop out the seeds and guts. Drizzle with olive oil and place cut side down on a baking sheet. Roast until fork tender, about 45-55 minutes. Scoop out 1 cup of the pumpkin flesh and reserve the rest for another use. This step can be made ahead, and the pumpkin mash stored in the fridge for 3 to 4 days. No doubt fresh pureed pumpkin is where it’s at! 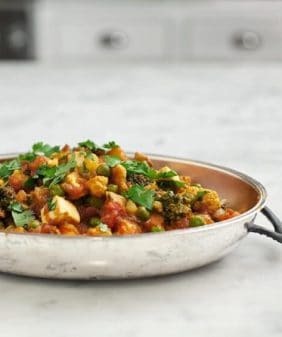 Love how you’ve used it here in this simple yet flavorful Curry. Pure comfort. What an interesting mix! I love these flavors, perfect for a crisp fall evening. 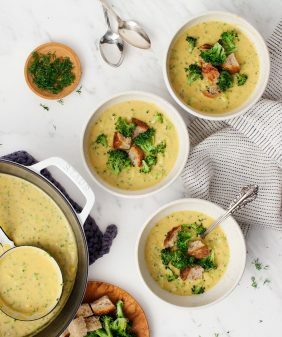 Yum- I love the idea of pairing coconut, pumpkin, and broccolini. This looks like it tastes vibrant. What a beautiful bowl of sunshine! Love the combination of flavors you have going on in this curry. Really nice. This recipe looks amazing. I’m a little intimidated about making my own pumpkin puree but I’m gonna give it a go. I love the idea of incorporating pumpkin into curry. It actually seems so suiting. I can’t wait to try this! Pumpkin coconut curry is one of my staples in the cold months. I love the red curry you add to this one along with the broccolini. This definitely helps me to get in the mood for the season. Thank you so much for sharing this recipe, it looks and sounds great! 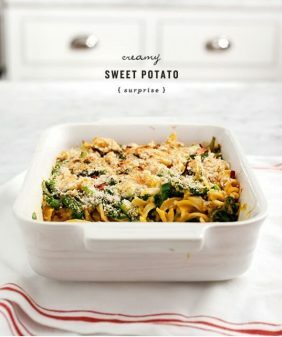 Wow – I just made this for dinner and it is amazing! I made the pumpkin a day ahead and it was lovely bonus to have the smell of roasted pumpkin in my house. The recipe was easy to make and my husband, who doesn’t usually like pumpkin in savory dishes, absolutely loved it. The pumpkin flavor is just right; it doesn’t overpower the dish. The healthy steamed veggies and tofu were the perfect compliment. The radish is not to be missed, it added a nice crunch and flavor. Can’t wait to make it again. Loved it! Healthy and delicious! Oh my god that looks really nice !! Pumpkins are love! I worked so hard on this but mine fell flat. The veggies were yummy but I made the pumpkin soup part and it just felt frothy and thin. I don’t know what I did wrong. Oh no – maybe try omitting the water, and using full fat coconut milk (or maybe just less coconut milk). Start with it thicker, and then you can always thin it out more as you go (mine was pretty thick to begin with). I find that brands (and even cans) of coconut milk can vary. It’s hard to find fresh pumpkin where I live – do you think butternut squash would be a good substitute? Hi Polina – yep, butternut squash will be a great substitute here!